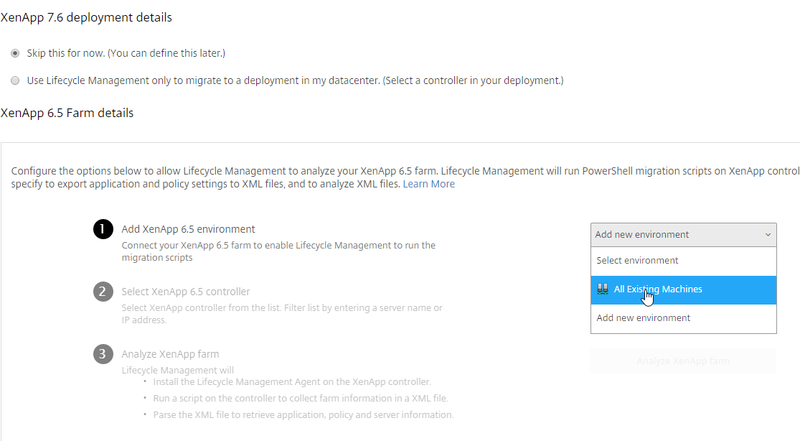 At Citrix Synergy Citrix announced several new things, one of them was Citrix Lifecycle management. There is much to tell about Lifecycle management but one thing I’d like to focus on here is the upgrade options it offers. The Upgrade of a deployment is an option of the design feature of the workspace cloud. As you see on the left is the workspace cloud option I wrote earlier about and on the right is the lifecycle Management. When you click on the Go button of Lifecycle Management a new screen open with many many options. As we are looking at the upgrade part I’ll point you to one of them. The last option on this screen is the Upgrade option, if you want to automate the upgrade of your old Citrix environment to 7.6 this is where you want to go. So after you select that option the process is shown, the most important part of the upgrade is the preparation. So read and understand what they will do to your environment before you continue. The projects you have running or configured are shown in the lower part of the screen, I still have none there. 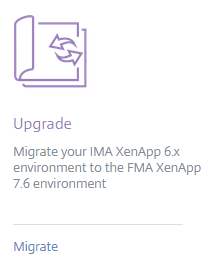 So let’s assume you have a XenApp 6.5 environment running and you want to upgrade to 7.6. Select the last upgrade option and click on ADD. I named the project XA76 but any name will do there, if you have more projects configured a description might be handy I think. 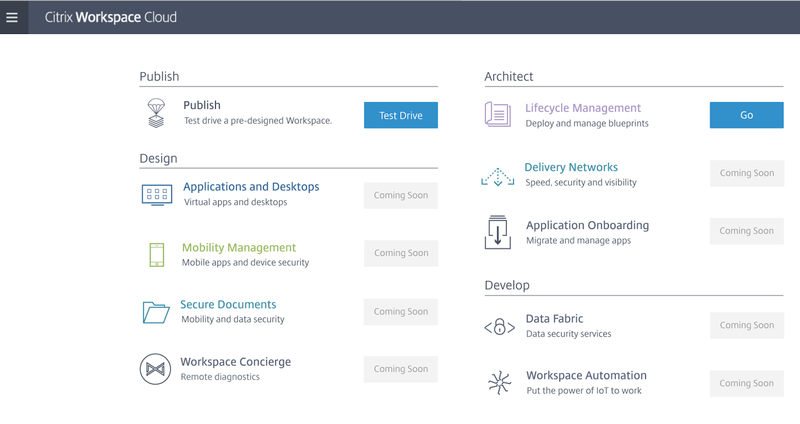 With the first one Citrix Workspace Cloud will connect to your resources and conduct all steps automated, they will connect to your environment, analyze it and migrate the settings to the new version ( or at least the settings they can migrate). Below is a nice graphical overview of the steps Citrix takes to migrate your environment. First you need to create a new 7.6 site (or perhaps you have one already), next the applications and policy settings are analyzed. You will be able to choose which settings you want to migrate at this stage. Citrix will connect to your environment over 443, they will only use 443. The option is to pick the partially option and do the migration yourself. The analyzing is done like the automated option but the migration is done with downloadable powershell scripts. You don’t need to be connected to the Citrix Workspace Cloud when doing the migration with this option. For people who want to be in control (me) this is the way to go. 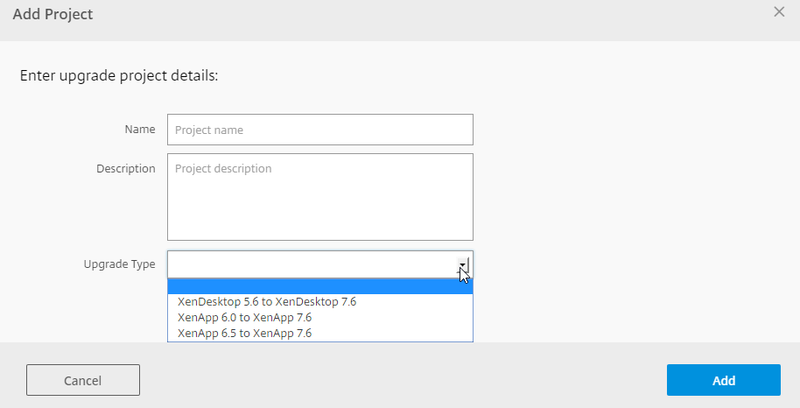 So first we select our 6.5 environment or if you didn’t have connection setup yet from Citrix Workspace Cloud you can do that here. I selected All Existing Machines and went further. Next step is to select the controller of the 6.5 environment, Citrix Workspace Cloud works with controllers that communicate with the Workspace Cloud. Well here I ran into a problem for I don’t have a 6.5 environment for over a while anymore… Last years Citrix was pushing everyone to upgrade and move on. We did just that and moved all our customers to newer versions and products. My own lab is also on a new version and I don’t see why I would install 6.5 just to test this. The next step is to select the 7.6 environment. After you select the new environment you will be asked to enter the credentials needed to communicate with the controllers. You will do a review and if everything is okay, you click migrate… that basically it. If you want to do it partially, a bit by Citrix and a bit by yourself you need to read the documentation which is found here. Click on analyze to analyze the XML for correctness. Run the PowerShell scripts in your 7.6 environment. I hope this blogs shows you just a bit more than you heard a Synergy and show that Citrix gives an option for those customers still on XenApp 6.x or XenDesktop 5.6.